Elizabeth “Liz” (Allen) Fuller – of Woburn, March 25th, at sixty-six years of age. Beloved wife of the late, Retired Fire Captain David W. Fuller. Devoted mother of Jennifer DeGrandis and her husband Michael of Needham. Longtime loving companion, David Collier of Tewksbury. Loving sister of Victor Allen and his wife Rita of Woburn and John Allen of NH. Adoring “Nana” of Brian, Michaela, Sophia, Olivia, Jackson and Liam. Relatives and friends are kindly invited to attend a Funeral Service in the Lynch-Cantillon Funeral Home, 263 Main Street, Woburn on Thursday, March 28th at 11:00 a.m. Calling Hours will be held from 9:00 to 10:45 prior to the Service. Interment in Puritan Lawn Memorial Park, Peabody. For directions or to leave an online condolence, story or message, please visit www.lynch-cantillon.com or find us on Facebook. 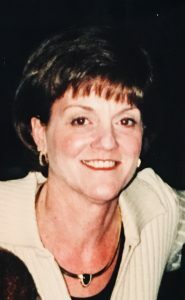 Elizabeth C. “Liz” (Allen) Fuller, beloved wife of the late Ret. Capt. David W. Fuller passed away at the Mass General Hospital, Boston on Monday, March 25th, 2019 after a most courageous daily battle with Lymphoma, over the last several years. Liz was sixty- six years of age. Born in Arlington, she was one of three children born to the late Lester C. and Antoinette (Pecora) Allen. Raised in Woburn she was a graduate of Woburn High School along with the Class of 1970. Just following high school Liz began her career as a Bank Teller at the Woburn National Bank. Liz’s pleasant smile and friendly demeanor lent itself to her “window” being constant and busy! Her tenure at the Woburn National Bank went from 1968-2000. Liz then at the Woburn Municipal Credit Union 2000-2011. Again, Liz loved what she was doing, and it showed each and every day. Together she and Dave were devoted to raising their daughter Jennifer. Together they had enjoyed wonderful trips, to many different islands and states and had the pleasure of going to both Hampton Beach every summer, and also to Falmouth. At both Falmouth and Hampton, it was gathering place for all family and friends , cook outs, games, swimming and many long comforting walks on the shores of the Atlantic. Liz was a very active person who absolutely loved to shop! With her daughter and mother they would venture off on shopping sprees at a mere suggestion! Saturday, Sundays, or just any day, was always a great day to shop! Every Thursday evening was “night out with the girls!,” with whom she has shared decades with a wonderful group of high school and work friends. They all truly enjoyed each others company and developed trusting and lasting friendships . Over the last eight years she has enjoyed the loving companionship of her dear friend Dave Collier. Together they had shared many wonderful times and travels together , while also enjoying their families and all of the different familial activities that have taken place over the years. Sadly, the last several years were difficult for Liz, but she never lost hope. Every day right up to the end, Liz gave a hundred and ten percent, accepting each and every day, as difficult as it was, with a greater hope for tomorrow. Liz was sadly predeceased by her dear husband of thirty seven years David, along with her parents Lester C. and Antoinette. Liz is lovingly survived by her daughter Jennifer DeGrandis and her husband Michael of Stoughton. Longtime loving companion, David Collier of Tewksbury. Loving sister of Victor Allen and his wife Rita of Woburn and John Allen of NH. Adoring “Nana” of Brian, Michaela, Sophia, Olivia, Jackson and Liam. Relatives and friends are kindly invited to attend a Funeral Service in the Lynch-Cantillon Funeral Home, 263 Main Street, Woburn on Thursday, March 28th at 11:00 a.m. Calling Hours will be held from 9:00 to 10:45 prior to the Service. Interment in Puritan Lawn Memorial Park, Peabody. For directions or to leave an online condolence, story or message, please visit www.lynch-cantillon.com or find us on Facebook. Relatives and friends are kindly invited to attend a Funeral Service in the Lynch-Cantillon Funeral Home, 263 Main Street, Woburn on Thursday, March 28th at 11:00 a.m. Calling hours will be held from 9:00 to 10:45 prior to the Service. Interment in Puritan Lawn Memorial Park, Peabody. For directions or to leave an online condolence, story or message, please visit www.lynch-cantillon.com or find us on Facebook. My sincere condolences to Liz’s family. I hope all your memories together bring you some comfort. Liz was a wonderful person. Jenny, we are so sorry for your loss. Our prayers are with you and your family. Your mother was a great person. I am sorry to hear of Liz Fuller passing she was a lovely person she was one of my tellers at the Credit Union and the best of friends with Maureen at the teller window as well, they got along so well with all of our Credit Union customers, Liz had a smile for everyone she had a difficult time with her health but most people never knew it, may she rest in peace now with her husband David. Worked with Liz at WNB. She was such a sweet person and always with a smile on her face. Sweet Liz- I will remember our many vacations, shopping trips, poolside get togethers and so much more. There was nothing more fun than making you giggle uncontrollably. Your laughter was contagious! You’re warm and loving demeanor will never be forgotten. I will think of you every time I walk the pond! Love you. Sad news to hear of Liz’s passing. Such a sweet lady. Always happy to see ya! Peace to The Fuller Family during this difficult time. I am so very sorry to hear this news of Liz. Like Arlene I remember so well the days when Jen and Shannon were in first grade together and the many field trips we chaperoned at the Reeves. My heart goes out to all her family. Liz always had a smile on her face! I know she will be missed by many. My condolences to all her loved ones. Liz and I grew up as close cousins (she was born the day after me) and I have the fondest of memories during those times. She was full of life, humor, positivity and strength and an incredible role model for all who knew her. Deepest condolences to all her family and friends. May God comfort you during this time of loss. The warmth of her memory will live on in everyone’s hearts. Rest In Peace sweet angel. So sorry to hear about Liz. Liz was a warm and caring gal with a beautiful smile for all she met. Loved working with her at WNB. She will be missed by all who knew and loved her. To the fuller family, my deepest sympathies and condolences. Jen, may your mother be at peace. My sincere condolences on the pass of your Mother, please call me anytime. Eternal memory. Out thoughts and prayers are with you all. The ones we love are never gone but live within our hearts. May you know peace and comfort. I am shocked and so saddened by your passing. I immediately thought back to our years together at Woburn National Bank. I enjoyed running into you from time to time and catching up. Now I’ll await until we meet again. My sympathies to the whole Fuller family. I am so saddened to hear of Liz’s passing; she was a wonderful friend of mine, she will be missed. My thoughts and prayers go out to her family during this difficult time.